If you want to see Louisiana grow, which jobs would you prefer to bring in: oil or tourism? One of these two top industries delivers twice as many jobs but has one-third of the wages. This article examines jobs and wages, defining what is called Export Jobs which in the long run determine our economic future. Mardi Gras is a perfect example of the strength of our economy to attract people who spend money on hotel rooms, taxis, car rentals, dining out, the latest fashions, site seeing, voodoo dolls and a host of other unique experiences found only in our nearly 300 year old city. But there is a bigger picture; it’s called export jobs. These are the jobs that serve customers outside the region, as opposed to jobs that serve local customers. 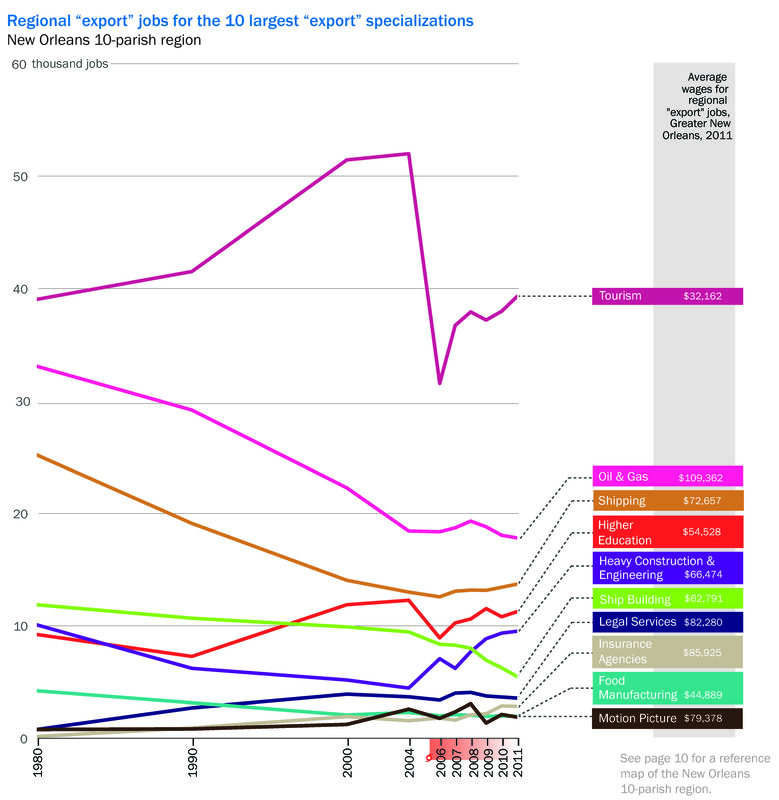 The reason we define export jobs is because if you have none, your economy is confined to growth of the region. Without export jobs, you can grow no more than the average, which today is around 2 to 3% annually. With export jobs, you have specialized industries that attract jobs from other regions that are void of those industries, resulting in faster than average growth. 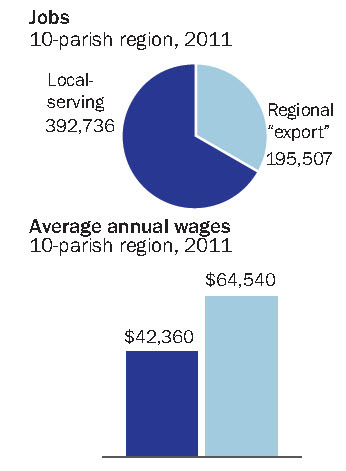 In the 10 parish region surrounding New Orleans, the highest export job industry is the 40,000 job tourism industry with an average wage of $32,162 annually. Second on the export job list is the oil & gas industry which is less than half the number of jobs at around 18,000 but with average wages of $109,362. Multiplying the number of jobs by the average wages results in an economic wage total of $1.2 billion for tourism and $1.9 billion for Oil & Gas, a 58% difference. The problem is that of all the export industries since 1980, only four (motion picture, higher education, insurance agencies, and legal services) have increased job growth and the other seven are in a state of decline or stagnation. Oil & gas jobs have been leaving the region since the 1980’s, and the same for the shipping industry. Katrina killed our shipbuilding industry but boosted construction and engineering. There are 195,507 jobs in the top 10 export industries, compared to 392,736 jobs in other industries, so our future growth depends on 50% of the jobs. The average annual wage of export jobs is $64,540, compared to $42,360 for local jobs. While the future growth may be in the motion picture, higher education, insurance and legal industries, the number of jobs produced still don’t surpass ship building. But that is a snapshot of how the economy looks today, and our economy is always evolving and adapting to trends. One look at the chart above and you can easily determine the downward trends today but also forecast where the job trends might be ten years from now, and it doesn’t look good. Looking forward, thank goodness the Louisiana legislature a decade ago passed the Louisiana Motion Picture Act that made the movie industry think of us and thank you to Tulane for spitting out so many lawyers. We will save for later the research on why the insurance industry is growing; but at least we have four great export industries driving growth of the Louisiana economy. If you want to help Louisiana grow, preserve our oil industry and keep churning out petroleum engineering graduates, but also court our motion picture, higher education, insurance and legal industries that could determine our future growth.